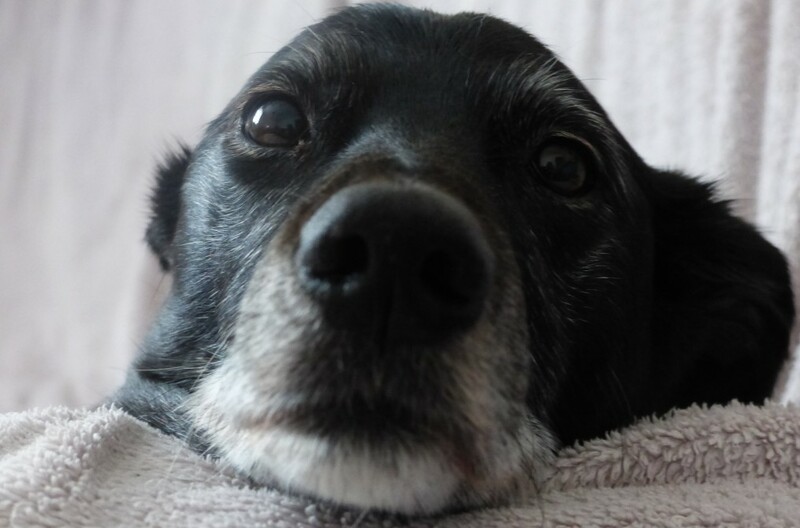 I first started getting treat dispensers when mum had to go in wheelchair as they kept me busy in the flat when mum had to rest and stopped me trying to dig up the communal gardens when I was young and we didn’t have our own garden. The latest puzzles by Nina Ottosson are very good but not always graded accurately to how easy they are to work out. They can sometimes be quite expensive. Todays reviews are of 4 Nina Ottosson Interactive puzzles that I have. This is the Dog Casino. This is good fun and quite easy. Basically all a doggy has to do is work out how to remove the plastic bones so the drawers will open and you can get your treat!! This is the plastic but quite durable. It got pushed off the bean cube several times in an attempt to get all the treats out at once! But mummy is strict.. I have to learn to play with them properly or they get taken away. First we tried it on the floor. but I was so impatient to get to my treats I kept trying to tip it off and just wacking it with my paws, so mum put it on a her beancube so I could only use my mouth to remove them and pull open the drawers. To make it easy to start with its best if treats are put in every drawer so whichever one is worked out first, you get a reward. As it gets too easy mum only puts treats in some of the holes and I have to only remove bones from the holes corresponding to the correct drawer to make it a bit harder. Sometimes I watch her put them in and its a memory game, other times I have to leave the room and then find the right drawers by sniffing them out! Here’s a short video clip of me trying to work out which bones match which drawers! It’s quite easy for me now, but mum got this one cheap off ebay as some of Nina Ottosson puzzles can be a bit expensive and if your as smart as me and work them out in a few minutes.. your owner may get annoyed that it hasn’t kept you busy for long!!! 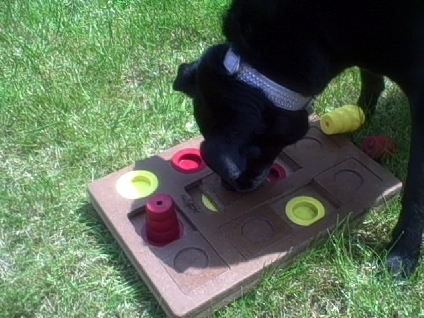 One such puzzle was Doggy Chess, think mum paid about £25 for it, it was described as ‘Advanced’ but it took me about 2 mins to work out how to do it! a game of chess in the garden! Basically mum hides treats under the ‘cones’ and under the sliding bits, the cones have to be removed before the sliding bits can slide. 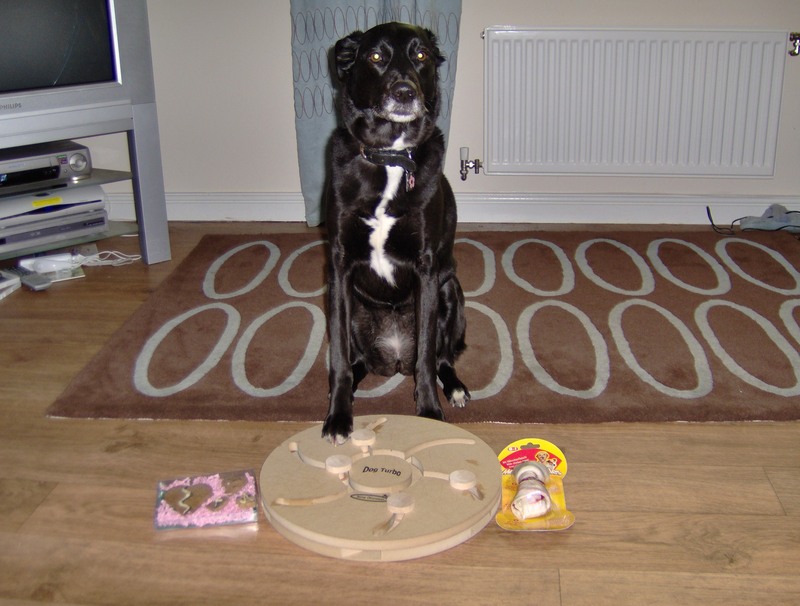 My third puzzle was actually the first Nino Ottosson puzzle I ever got, it was the Dog Turbo. This one is all wood. The wooden ones tend to be a bit heavier for lifting than the plastic ones, so don’t drop them on your toes when filling them for your doggies!! 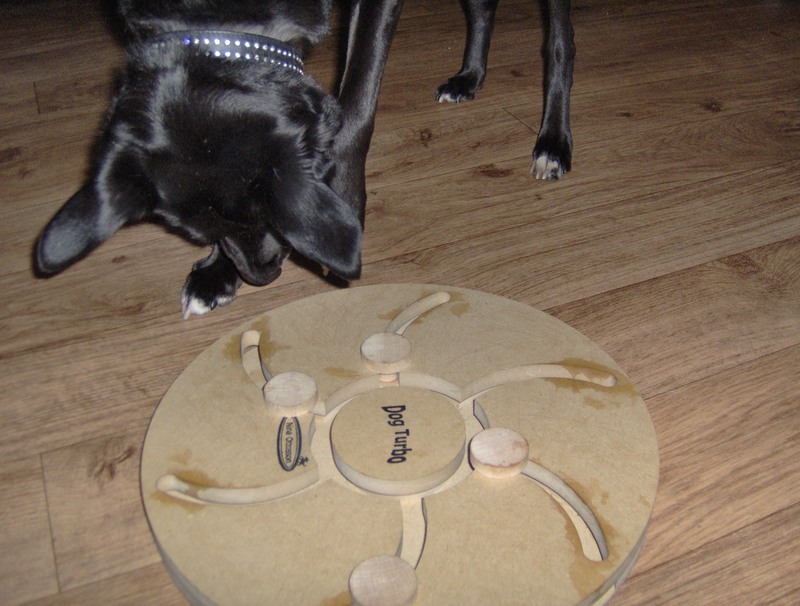 The idea is for your dog to use their nose or paw to move the wooden pegs along so they push the treats out of the ends. This one has been the best value as it can be made harder in several different ways. Easiest way is to just use your tongue to push the treats out to the end and to start with mum placed the treats near the end unobstructed. To make it harder she would place the treats behind the pegs so I had to work out how to move the pegs to get the treats out. 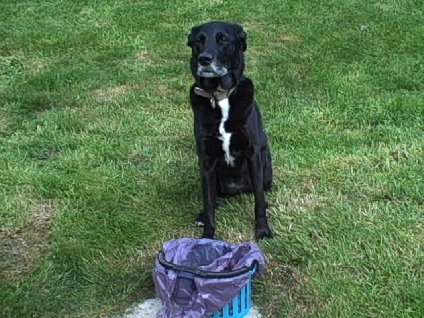 treats can be placed either side of pegs, to make game easier or harder.. It is better to use more solid treats in this toy such as kibble as softer ones (such as tidbits of cheese. sausage) can be squashed if the pegs run go straight through them. I think mum thinks this one was the best value! 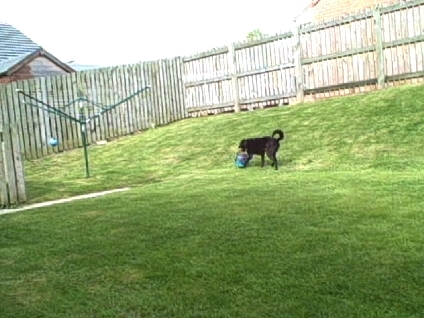 Here’s me caught on camera cheating and licking the treats out! The last one I got was called Dog Tornado, I got that last xmas. Luckily mum got this one cheap too with my food order as I can now empty it in under a minute. They are all easy to fill/set up for owners with mild dexterity problems. The bones in the casino are easy to pick up for both owner and dog. 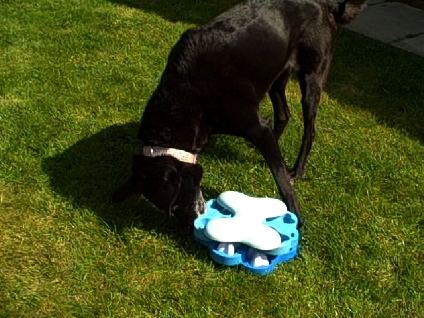 The bones were bit tricky to get out of dog tornado at first with the rounded top when i put my claw over them to try and pull them out my paw just slid off. The puzzle also slides alot so its better on a thicker carpet or played in garden on grass, its easy for a dog to tip over. 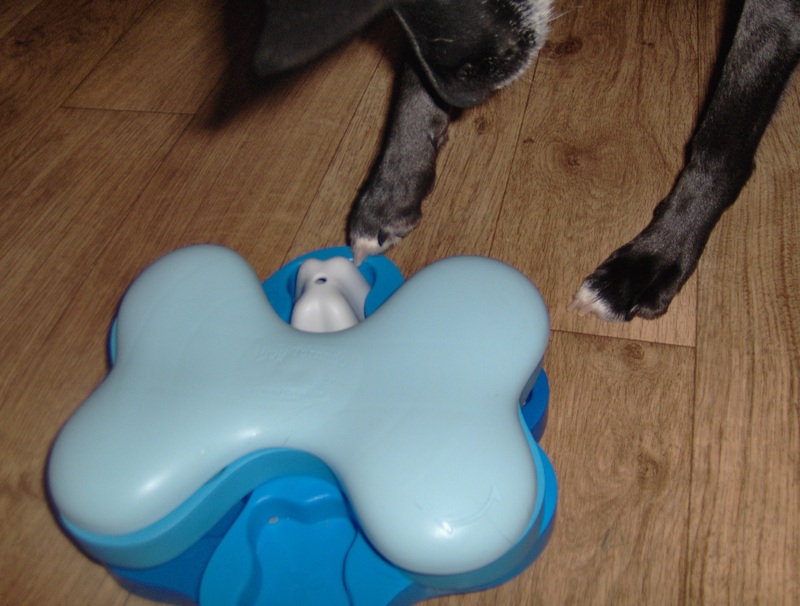 Hope you enjoyed my review, I’ll do another some time about other good treat dispensing toys to keep your doggies busy. Don’t forget to take the treats out of your dogs food allowance so they don’t get too overweight. 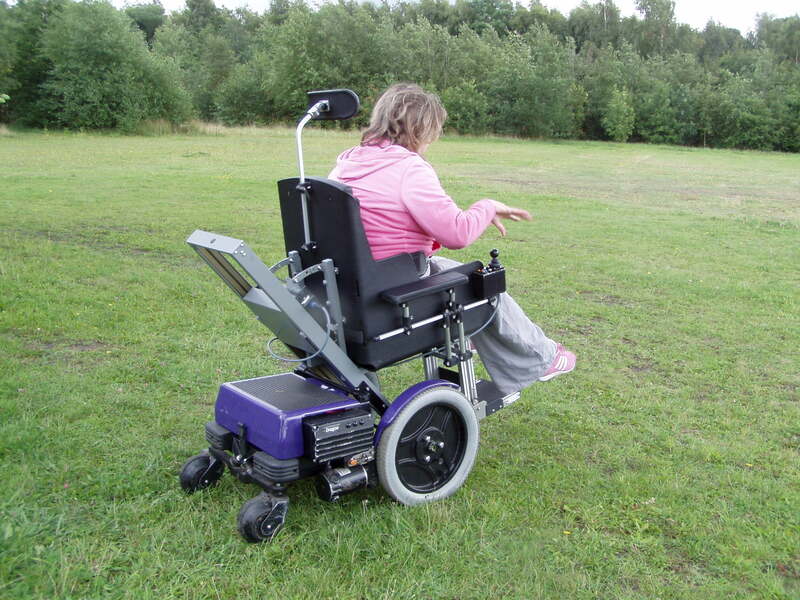 Last Wednesday I test drove the Dragon chair from Dragon Mobility. I was interested in the feature where it lowered you to the ground, as I thought it would make getting back up easier, but I wasn’t sure about my weight as I am right at the max end of the weight limit. 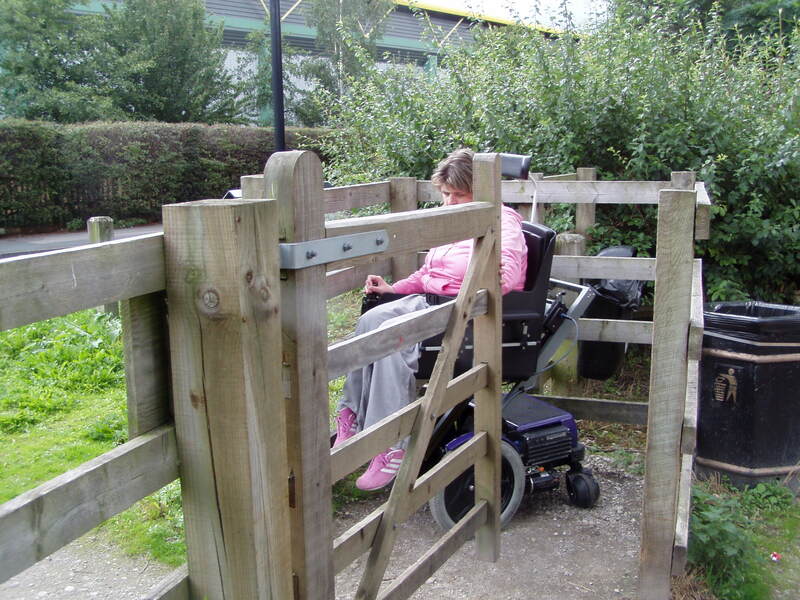 It has a weight limit because of the way the seat is mounted onto an ‘elevator’. 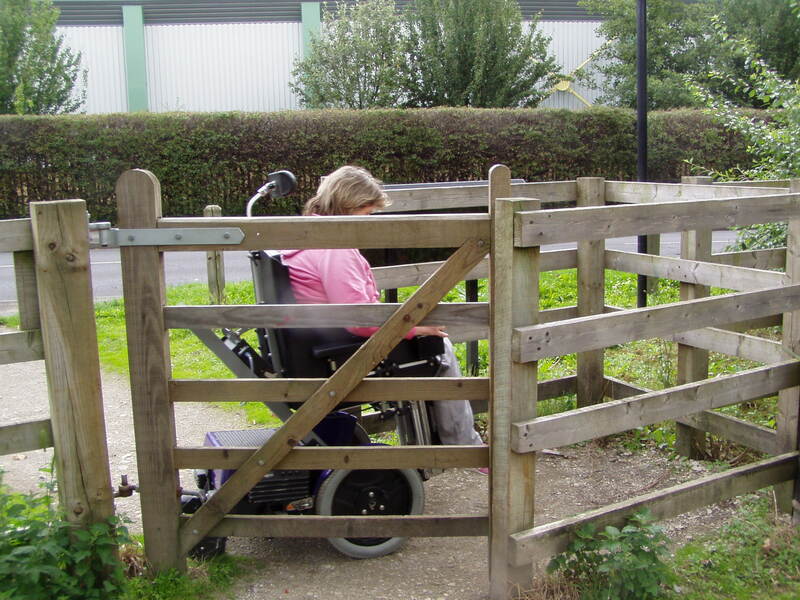 The Dragon is built by a man called Dan Everard, who made the very first one for his daughter Ruth who was born with Spinal Muscular Atrophy, you can read more about how the Dragon came about by clicking on this link. The Dragon is an excellent chair, I love the idea of been able to get down to the floor and rise up to reach in cupboards. Around the house, the compactness of the Dragon and its FWD maneuverability meant I could get directly out of my bedroom door into the lounge (which is L shape – 90 degree angle) which I can’t do with my Vibe electric chair. However I did struggle with controlling it outdoors, maybe because it was torque controller and it was more responsive to movements and pressure put on it, maybe partly cos I also never driven a FWD before and I now understand the term ‘fishtailing’! (back end tends to swing left to right at higher speeds as there’s no weight over the castors). As the seat is kind of ‘perched’ on the elevator rather than on top of the base it did move more which I found a little unnerving, the seat also seemed to respond more to twitches and if muscles tensed and relaxed which I never relaised mine did it as much until I sat in this chair. I am only used to driving a mobility scooter or my Vibe which have solid seats that don’t move if you move unintentionally. It may have been partly cos I was at the top end of the weight limit as well. I don’t think a small light child or adult would have the same issues. The chair is designed to be very agile and respond to the person in it and I think its better suited to children or small adults. 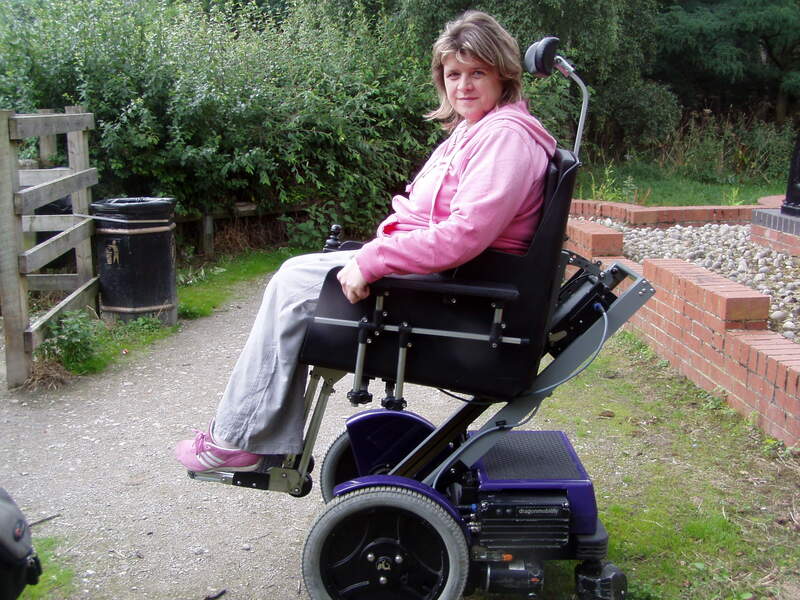 Its great for indoors if you are small and need a chair to get you around school/college/workplace where tight spaces. It easily fitted in my bathroom and I could even get out of my double doors into bedroom with it, which is a tight squeeze cos chest of drawers is behind one of the doors and end of the bed in front. 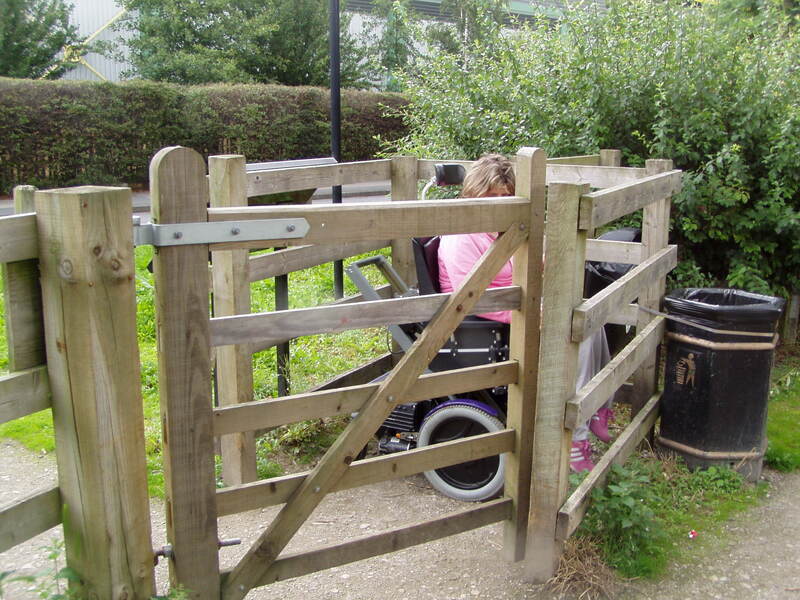 I also loved the seat riser function and it made things so much easier and safer getting things out of kitchen cupboards without having to balance with one arm and try to get item out with other. Whichever chair I go for next needs a seat riser on it to help me in kitchen, but I also want it to be able to get me out in the snow when my scooter can’t. it just fit with footplate up.. I was worried how the small back castors would handle things like grass, but they have been designed by the inventor himself. If you can see what looked like ‘grey stripe’ in middle of back castor on picture above? 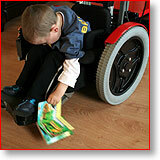 That is raised.. when you are on flat, that part is touching floor and gives the chair its maneuverability. On softer grass where castor will tend to sink into ground a bit the full surface of the castor is then in contact with the ground. Very clever design!! OK, It’s my turn to blog now! I decided to tell you about my unique laundry skills! 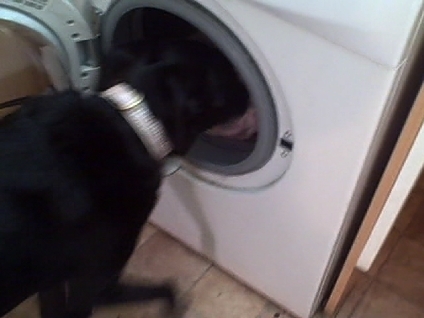 Today mum washed the bedding so after helping her pull the bedding off and carrying a pillowcase or two to the washing machine it was time to get the washing out. I usually take short cut straight across garden! 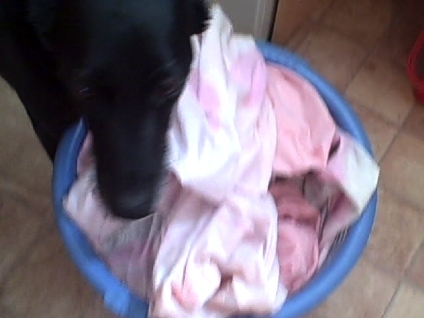 .. then wait for mum at the end with the pegs! 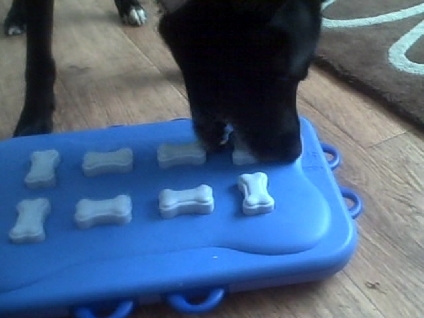 then I get my treat which varies, sometimes its a big chew, a chewy rawhide shoe, treatball with biscuits in or one of my interactive puzzles.